Do you need to have extra secure (https) website to protect user data? If the answer to above questions is YES, You definitely need an SSL Certificate for your website to show your customers that your website is really safe and that any information or credit card number they enter for online payment or just to save the card number, will be safe. We will get a picture seal for your website so your visitors can see the seal on your website and feel safe browsing your website. Do you want to setup or own a large business or an e-commerce website or if you need a private SSL certificate for your website, then you need to set it up on a dedicated IP Address. We will set up your website on a dedicated IP address and get a secure SSL certificate for your website and perform all the setup. When using SSL your entire website is encrypted when its transferred to and from the server and helps to prevent hacker attacks based on eavesdropping. If you own a SSL certificate, you will also see a padlock icon on the web address bar. With increase in fraud and identity theft, online visitors look for the trusted SSL certificates or the seals on the website, so to show that your website is secure, specially if you are selling products online, or if you are storing any type of customers’ information, you may want to get an SSL for your website and have secure site seal logo somewhere on your website. Build your clients’ trust through the secure site seal. We will set it up for you, you don’t need a new website, the same website will be secured using SSL and we will do it for you for free when you get your website designed from us. 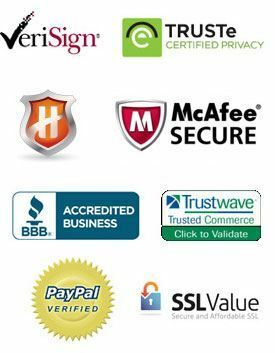 We deal with a lot of different companies who offer SSL and site seal and we will find the best price for you. We will beat any price by 10% so if you find any lower price, we will beat it by 10%.